"Saturn's A-ring and Enceladus are separated by 100,000 kilometers (62,000 miles), yet there's a physical connection between the two," says Dr. William Farrell of NASA's Goddard Space Flight Center in Greenbelt, Md. "Prior to Cassini, it was believed that the two bodies were separate and distinct entities, but Cassini's unique observations indicate that Enceladus is actually delivering a portion of its mass directly to the outer edge of the A-ring." Farrell is lead author of a paper on this discovery that appeared in Geophysical Research Letters January 23. This is the latest surprising phenomenon associated with the ice geysers of Enceladus to be discovered or confirmed by Cassini scientists. Earlier, the geysers were found to be responsible for the content of the E-ring. Next, the whole magnetic environment of Saturn was found to be weighed down by the material spewing from Enceladus, which becomes plasma -- a gas of electrically charged particles. Now, Cassini scientists confirm that the plasma, which creates a donut-shaped cloud around Saturn, is being snatched by Saturn's A-ring, which acts like a giant sponge where the plasma is absorbed. Shot from Enceladus' interior, the gas particles become electrically charged (ionized) by sunlight and collisions with other atoms and electrons. Once electrically charged, the particles feel magnetic force and are swept into the space around Saturn dominated by the planet's powerful magnetic field. 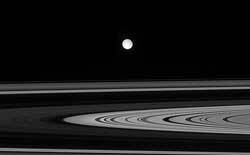 There, they are trapped by Saturn's magnetic field lines, bouncing back and forth from pole-to-pole. The fun ends, however, if their bouncing path carries them inward toward Saturn to the A-ring. There they stick, in essence becoming part of the ring. "Once they get to the outer A-ring, they are stuck," says Farrell. "This is an example of how Saturn's rings mitigate the overall radiation environment around the planet, sponging up low- and high-energy particles," says Farrell. By contrast, Jupiter has no dense rings to soak up high-energy particles, so that planet's extremely high radiation environment persists. The Cassini observations confirm a prediction by Dr. John Richardson and Dr. Slobodan Jurac of the Massachusetts Institute of Technology. In the early 1990's, Hubble Space Telescope observations revealed the presence of a large body of water-related molecules in orbit about 240,000 km (almost 150,000 miles) from the planet. Richardson and Jurac modeled this water cloud and demonstrated it could migrate inward to the A-ring. "We relied on their predictions to help us interpret our data," said Farrell. "They predicted it, and we were seeing it." At the time of their prediction, the source of the water cloud was unknown. 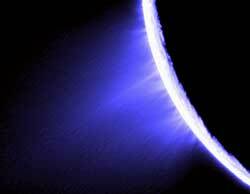 The source was not identified until 2005 when Cassini discovered the stunning geysers emitted from Enceladus. Data for the discovery that Saturn's A-ring acts like a sponge were collected in July 2004 when Cassini arrived in orbit around Saturn, making its closest flyby over the A-ring. "We skimmed over the top of that ring fairly close," said Farrell. Hot spots on the inside wall of the plasma donut -- the part colliding with the A-ring -- were emitting radio signals. These signals behaved as a sort of natural radio beacon, indicating the local plasma density at the inner edge of the donut. The signals were detected by Cassini's Radio and Plasma Wave instrument. The team used these signals to monitor the density of the plasma (the higher the frequency, the greater the density) and hence witness the change in gas density with time. "As we approached the A-ring, the frequency dropped, implying that the plasma density was going down because it was being absorbed by the ring," said Farrell. "What really drove this home was what happened to the signal when we passed over a gap in the rings, called the Cassini division. There, the frequency went higher, implying that the plasma density was going up because plasma was leaking through the gap." The research was funded by NASA through the Cassini-Huygens project. Cassini-Huygens is an international collaboration among NASA, the European Space Agency, and the Italian Space Agency. The Cassini orbiter was built and is managed by NASA's Jet Propulsion Laboratory, Pasadena, Calif.